Aboot 10,000 knichts an men-at-airms (o which aboot 1,200 war moontit), unkent thoosands o ither infantry, crossbowmen an airchers. 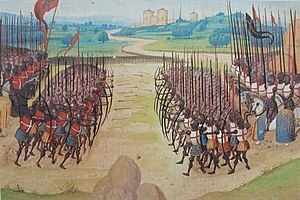 The Battle of Agincourt wis a major Inglis victory in the Hunder Years' War. ↑ Barker 2005, p. 227. ↑ 2.0 2.1 Curry 2006, p. 192. ↑ 3.0 3.1 Barker 2005, p. 320. Barker, Juliet (2005). Agincourt: The King, the Campaign, the Battle (U.S. Title: Agincourt: Henry V and the Battle That Made England.). London: Little, Brown. ISBN 978-0-316-72648-1. Curry, Anne (2006) . Agincourt: A New History. UK: Tempus. ISBN 978-0-7524-2828-4. This page wis last eeditit on 20 Februar 2018, at 23:39.